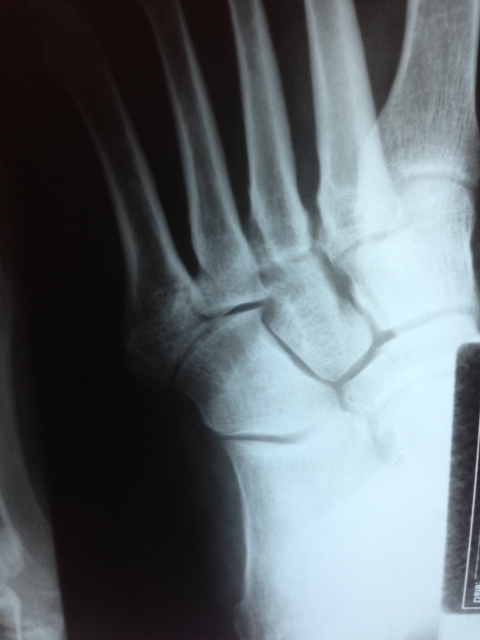 Tarsal coalitions are an abnormal union of two bones in the foot. This condition may involve one or both feet. Symptoms usually occur between the ages of eight and fourteen, depending on the location of the coalition. It will adversely affect a child’s ability to run or participate in sports. Coalitions are congenital in nature and not caused by an injury. Symptoms may first appear after an acute injury or after overuse to the foot or ankle. In 50% or more of the cases, it occurs on both feet. 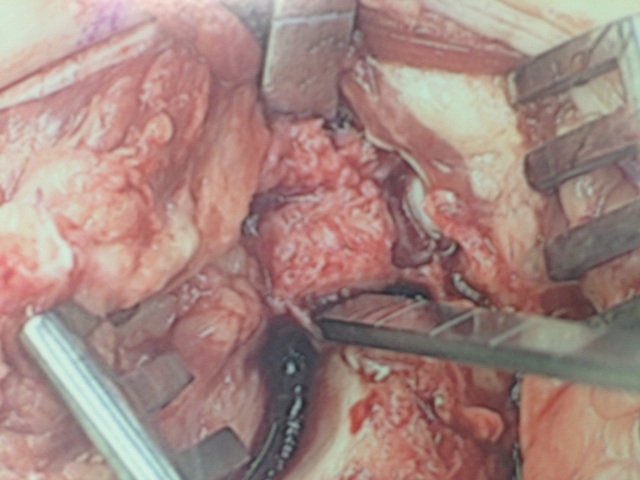 Usually due to failure of bones to separate with a resultant lack of joint formation. Pain in the foot and/or ankle, worse with activity and better with rest. Muscle cramps and/or spasms in the outer leg muscles. Stiffness and limited movement in the foot and ankle. Fatigue or tiredness in the legs, especially with increase in weightbearing activities. Muscle weakness in the legs. Pain in the knees, hips and/or back. Decreased motion in the midfoot and rearfoot joints. Pain with palpation over the midfoot. 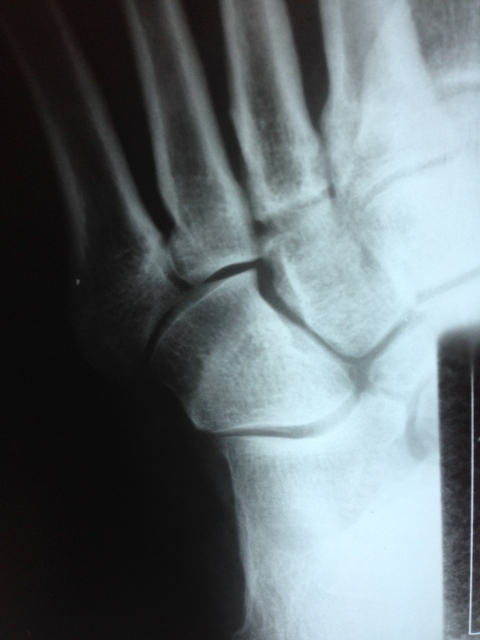 Pain with attempted range of motion of midfoot and rearfoot joints. 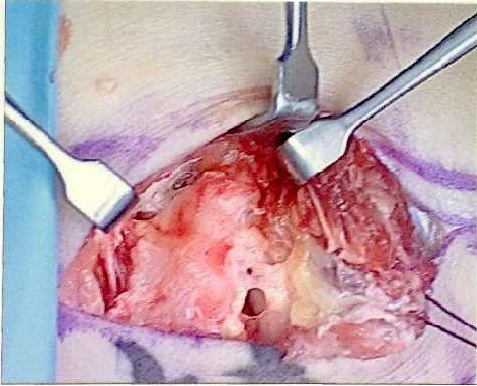 Tenderness in the legs due to muscle spasm and/or compensation. If one foot affected, one foot may appear to turn outward compared to the other foot. Spasms may be produced upon physical examination. X-rays are taken to determine type of tarsal coalition present. 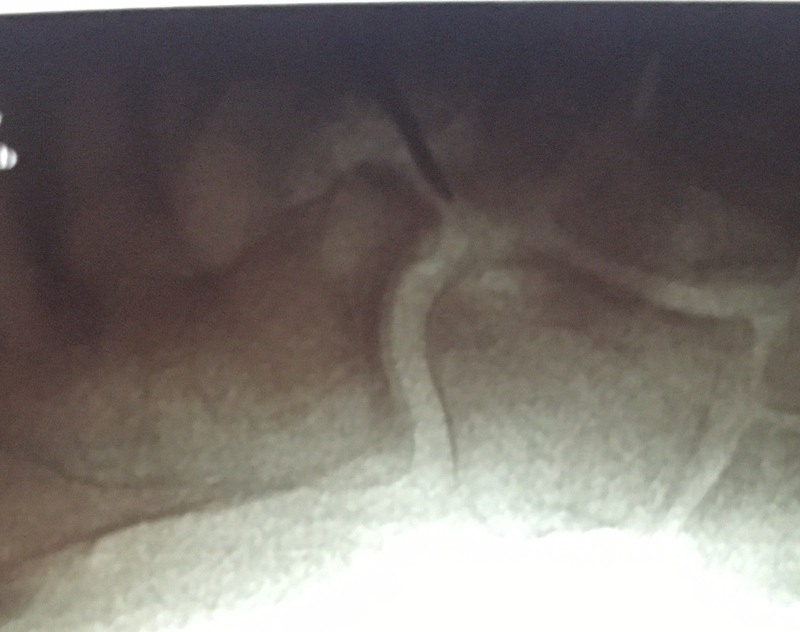 Due to the abnormal bridging, secondary changes including bone spurs and arthritis may also be seen. CT scans are always necessary to get better clarity of the problem. Acute symptoms of pain and swelling are treated with cast immobilization and rest. Physical therapy may be implemented to decrease muscle spasms and increase muscle strength. Orthotic devices are often utilized to prevent abnormal joint movement causing the pain. 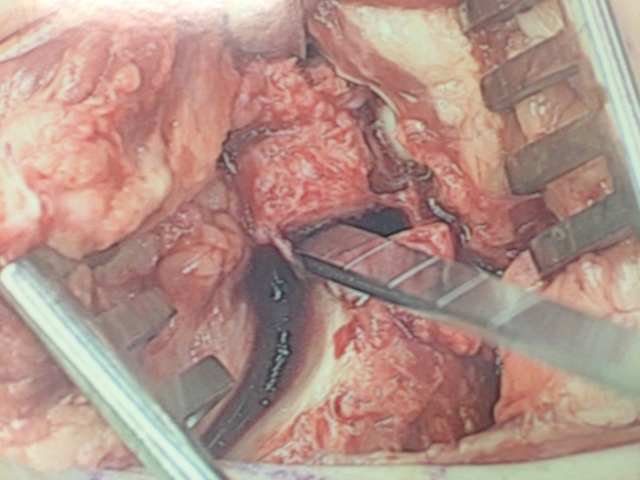 When a child has continued pain and difficulty walking surgical intervention may be required. 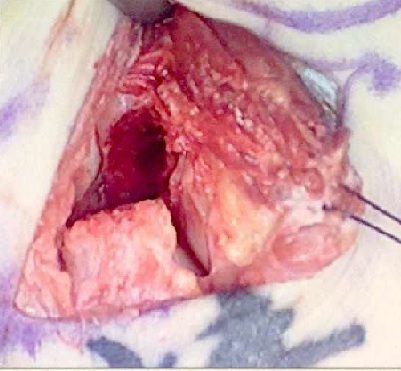 Certain coalitions (calcaneal navicular bars) can be removed with excellent long-term outcome. 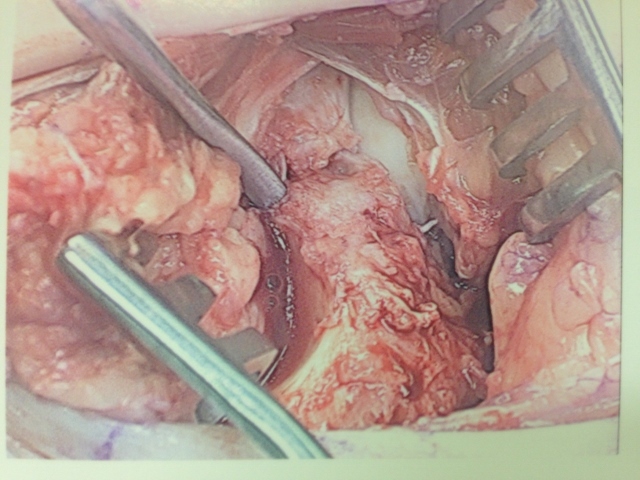 Other coalitions (middle facet subtalar joint) do not have as good of a prognosis. 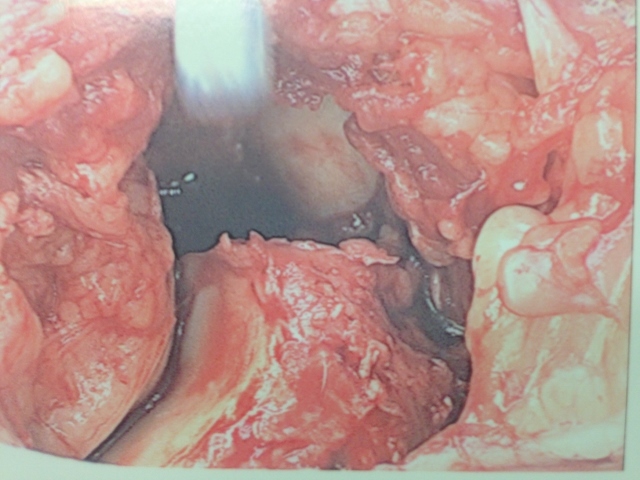 If treated early, good long-term outcome may be achieved. 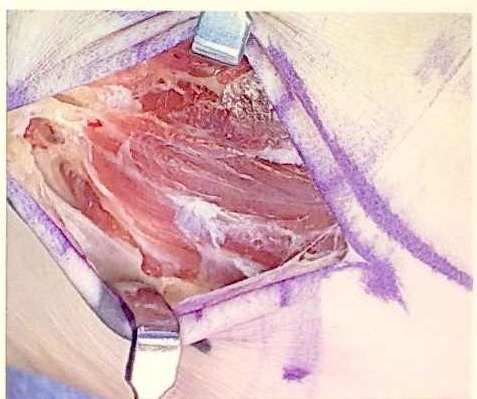 If treated late, the coalition may be too advanced to surgically remove and fusing the joint may be necessary to eliminate pain, spasm and deformity. 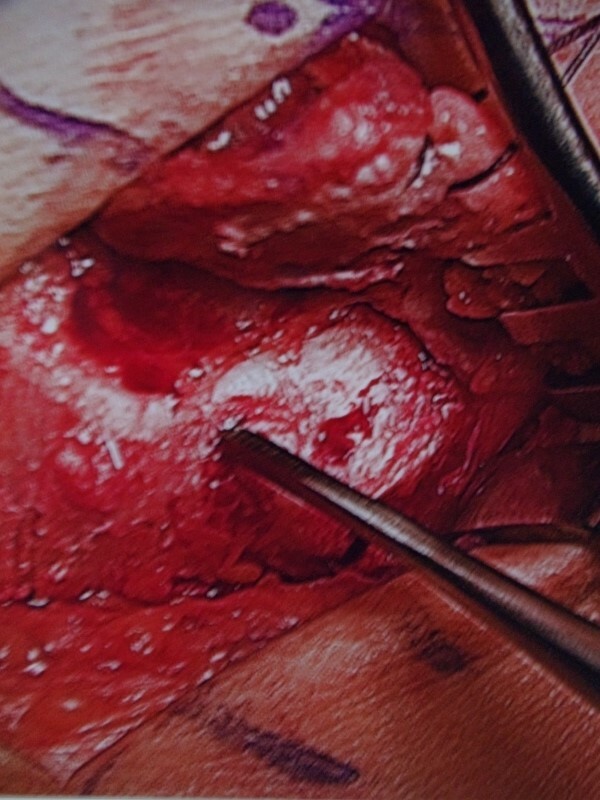 Excellent long-term outcomes are common following nonsurgical or surgical treatment of these conditions. If a fusion of the joint is necessary the pain will be completely eliminated and the return to most activities is common. On the left, the instruments are pointing to the coalition. 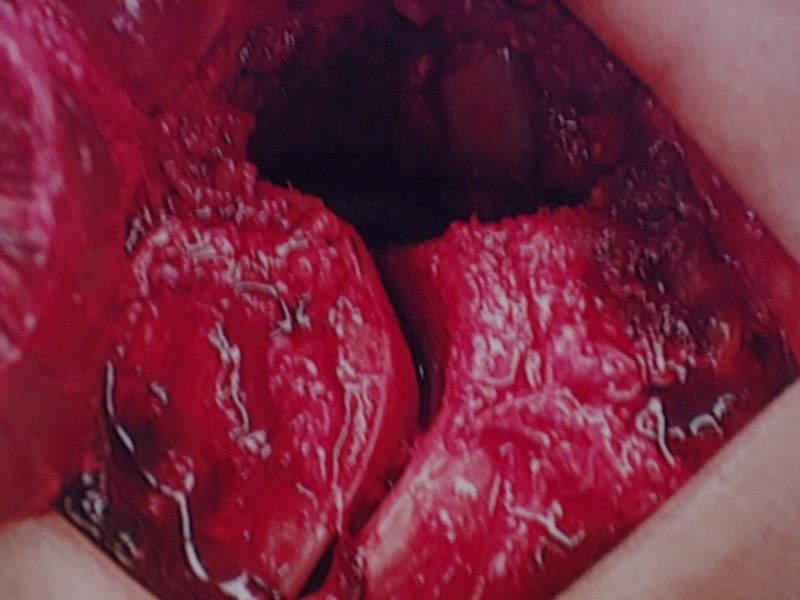 to the right, the insturment is holding the piece of bone removed. 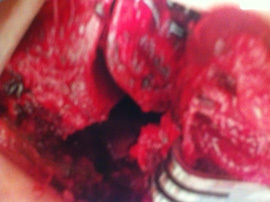 The 2 pics below are of the space left after resection of the coalition. 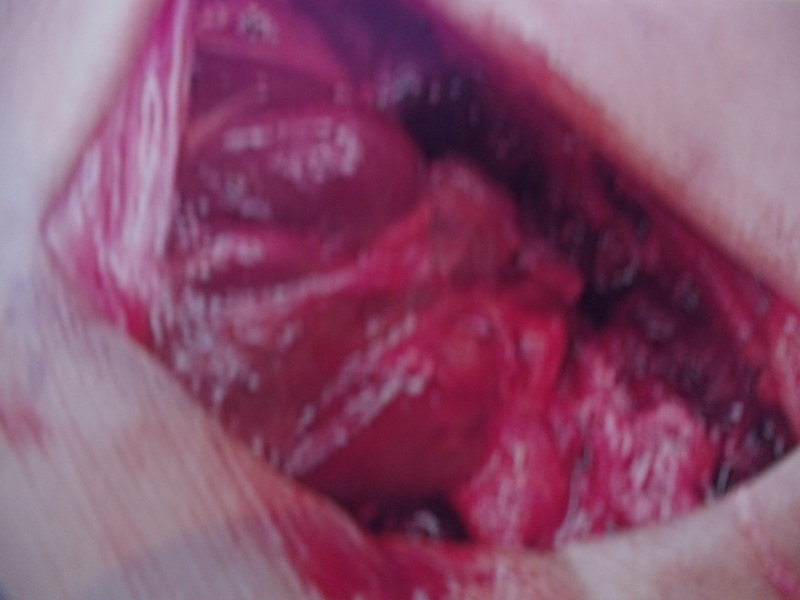 The talar head can be seen as the bright white portion of bone on the top left area of the void. The EDB muscle is transposed into the coalition resection site, which acts a spacer and doesn't allow regrowth of the coalition. X-rays depicting extension of bone between the calcaneus (heel bone) and the navicular bone (middle of the foot). The coalition is shown with arrows (top right and left), and circled (bottom right and left). 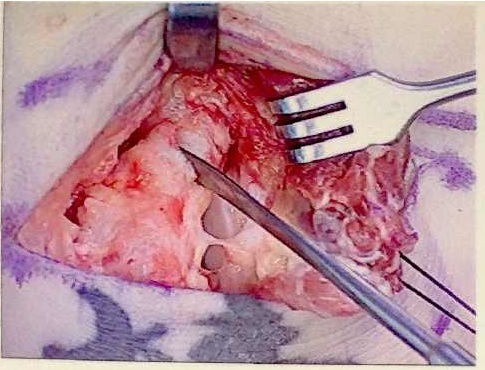 Surgical resection of the coaltion allows removal of restriction of range of motion in the affected joint and elimination of pain associated with the attempted motion. Pictured is the coalition at the point of the metal instrument. Pictured right is the newly created space where that coalition once was located. 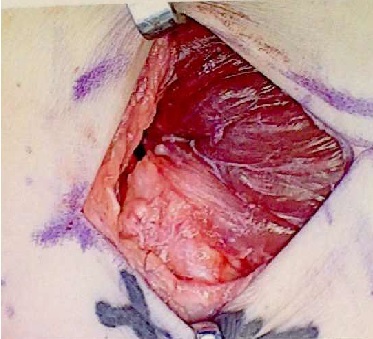 The last picture is using the FDB muscle belly as an interpositional graft to occupy the deadspace and decrease chance of recurrence. 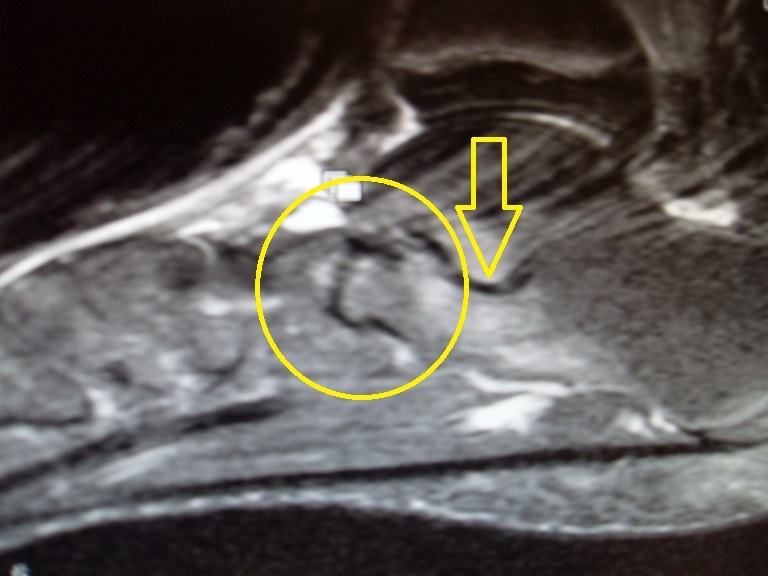 Below are CT images of a calcaneal-navicular coalition in a 12 year old male who has had pain for several months that worsens with activity. 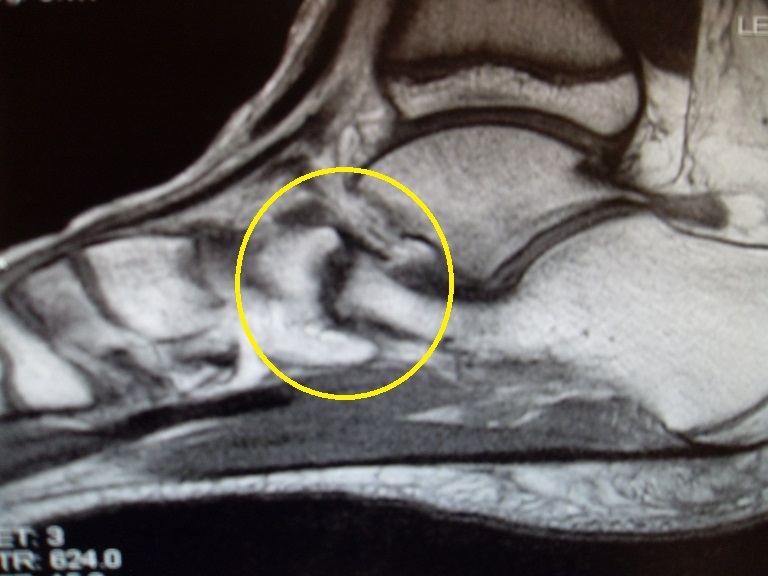 There is a T1 image (left) and T2 image (right) that show elongation of the anterior process of the calcaneus that is connected to the navicular bone acting as a block for movement of the foot. This area then causes pain from swelling in the bone at the joint (yellow arrow) with attempted motion. The area of coalition is indicated by the yellow circle. 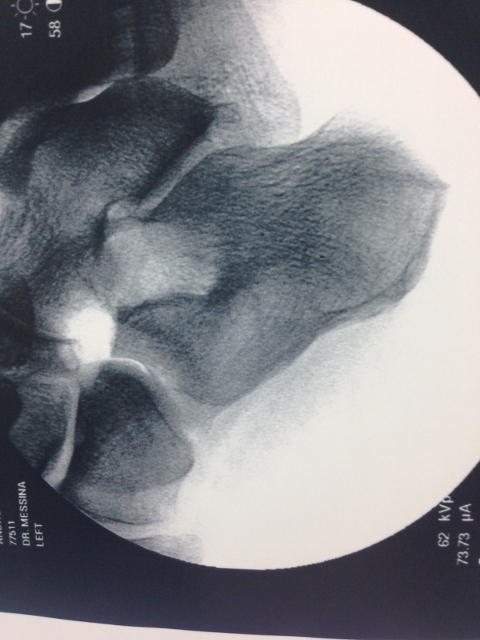 Below is another case of a Calcaneo-Navicular coalition that was resected surgically. 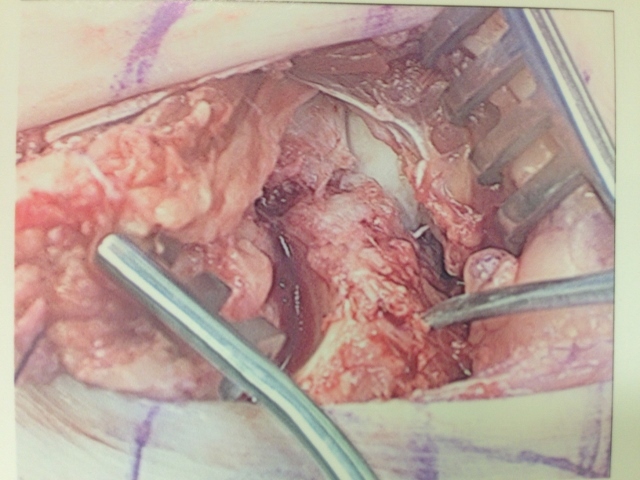 The first two pictures demonstrate the muscle overlying the coalition which is called the Extensor Digitorum Brevis. 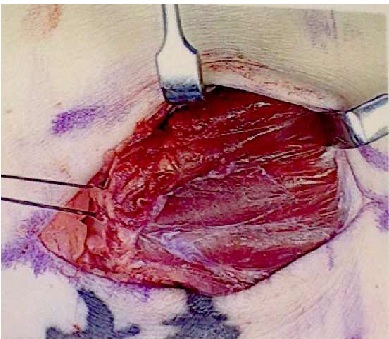 This muscle is removed from its origin and held aside to address the abnormal bone union. Which is seen on the picture to the right. 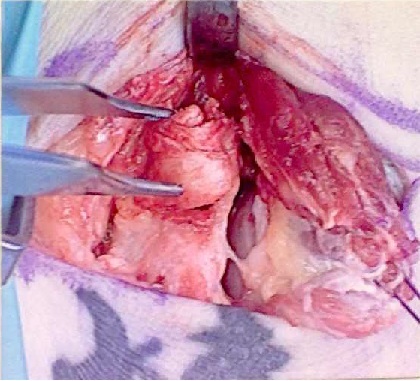 The next set of pictures show the delineation between the calcaneus and the navicular in which a bar has formed in the area where there should be adequate space. This bar prevent natural movement of the foot and can evenutally become painful if injured with activity. 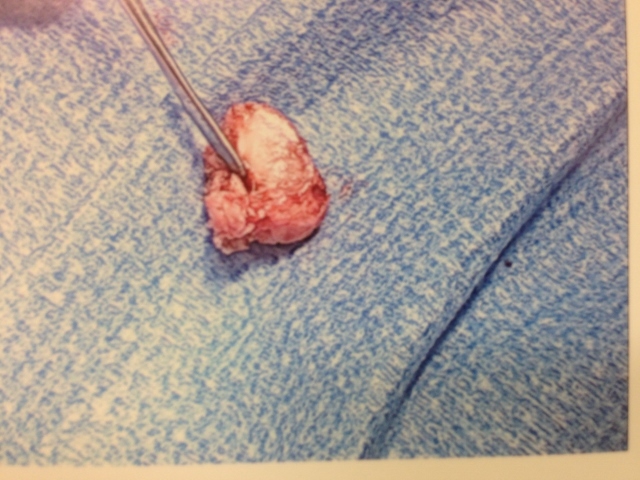 The picture to the right is the resected bone (bar) held by a pair of forceps. 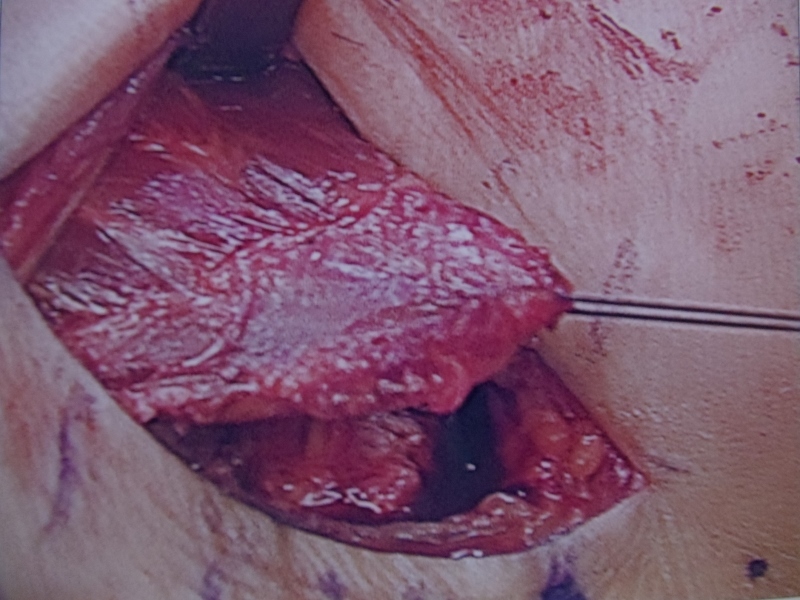 The following set of pictures shows the newly created space where the coalition was removed and the muscle (extensor digitorum brevis) is being held with suture (purple string). 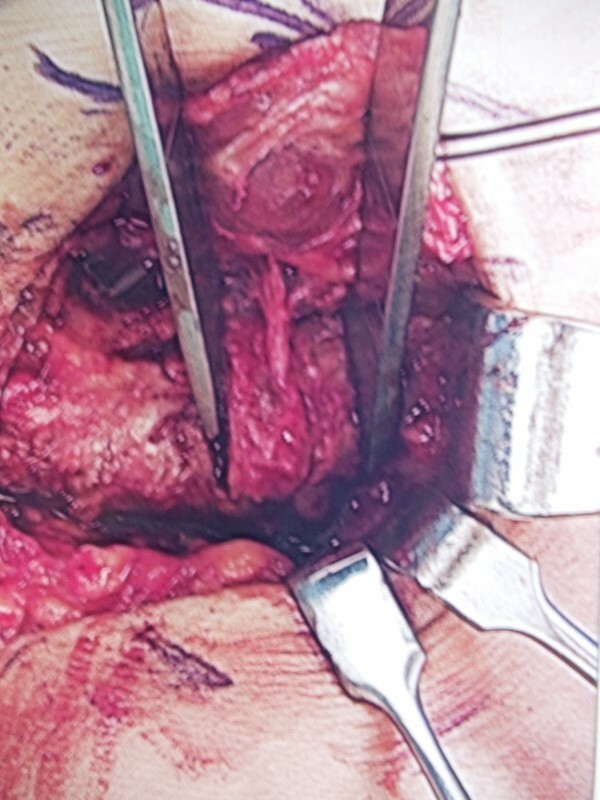 The final set of pictures is the muscle being held over the area that was resected and then the suture is pulled throught the area with a suture needle and held in place through the bottom of the foot with something called a suture buttom. 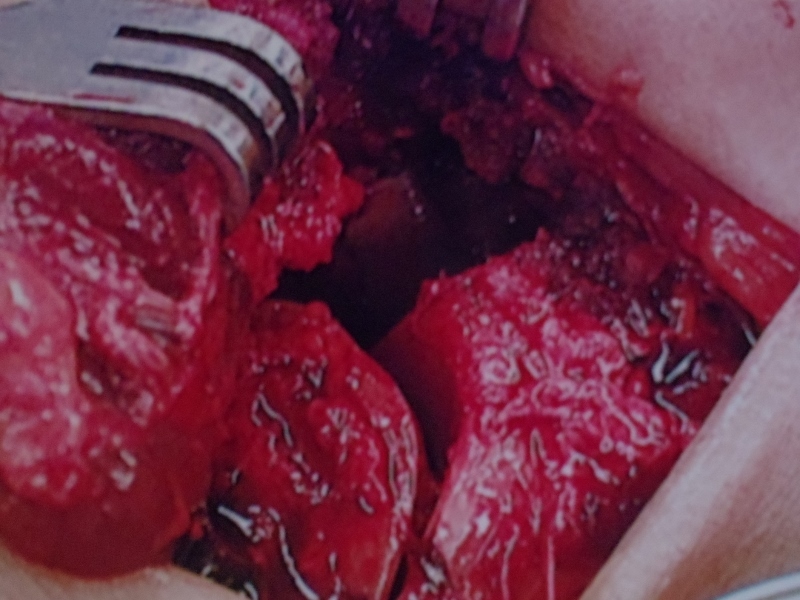 This will hold the muscle in place to heal in the area and the muscle will block any new growth of bone in the area which does tend to regrow bone and allow the problem to reoccur. 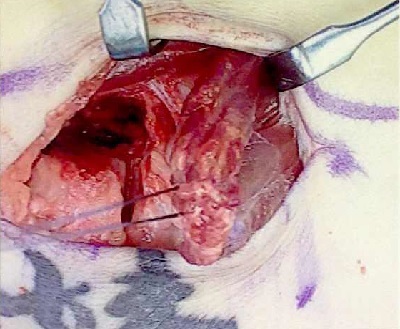 The area is cleansed and then the skin is closed with sutures as well. 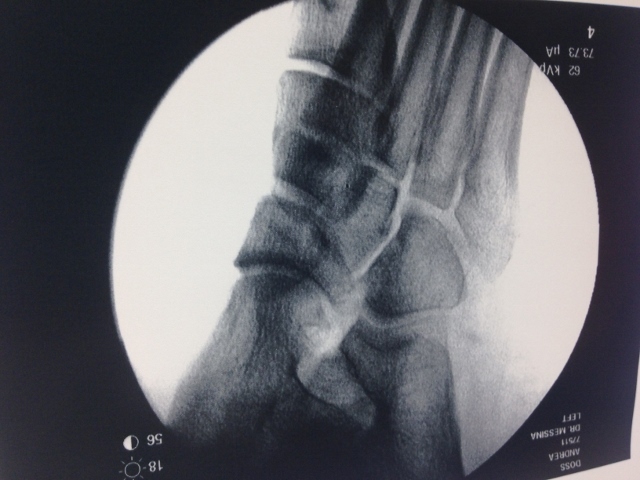 These are x-rays of a CN bar in a 34 year old female that complained of chronic pain on the outside of her foot. 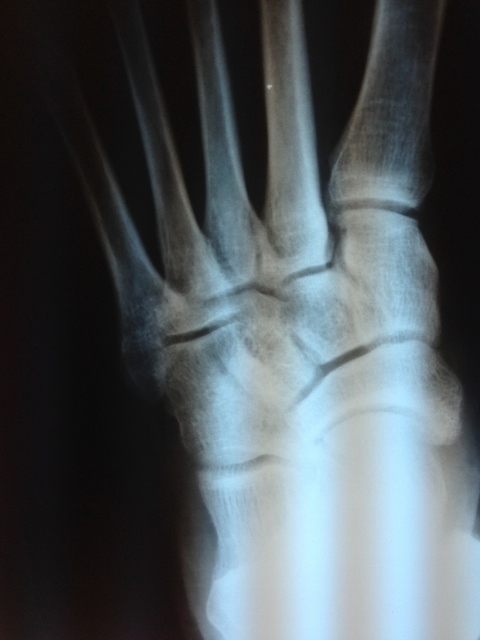 There is abnormal connection between the calcaneus and navicular. 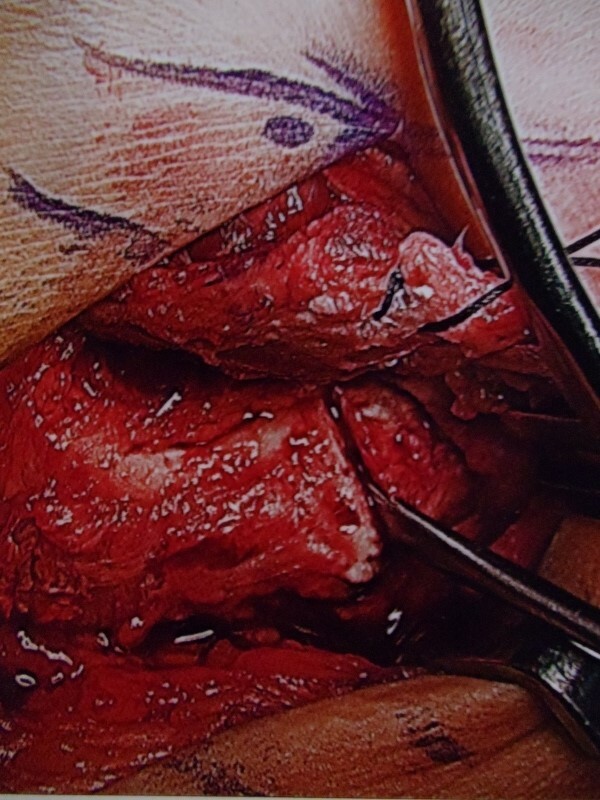 These are two intraoperative pics of the resection of the coalition. 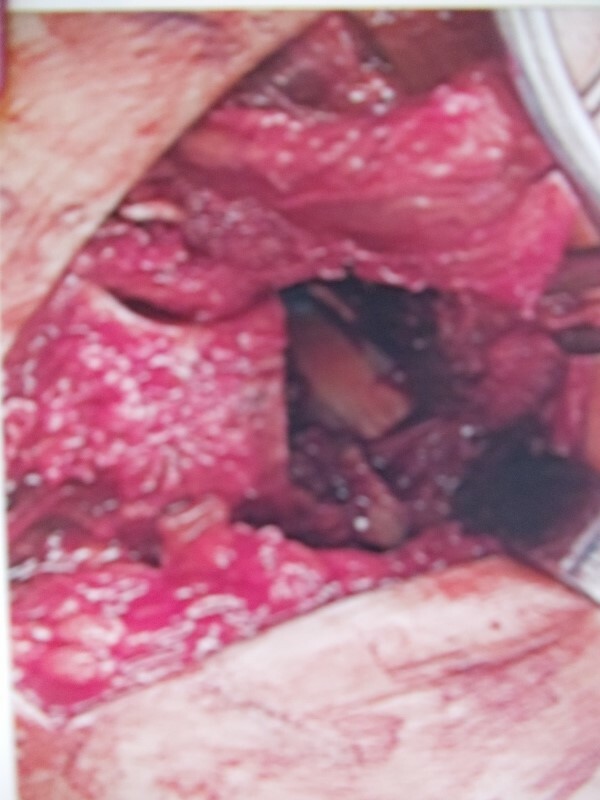 Increased space can be seen between the calcaneus and navicular after resection. The CN bar is seen at the middle of the pic. 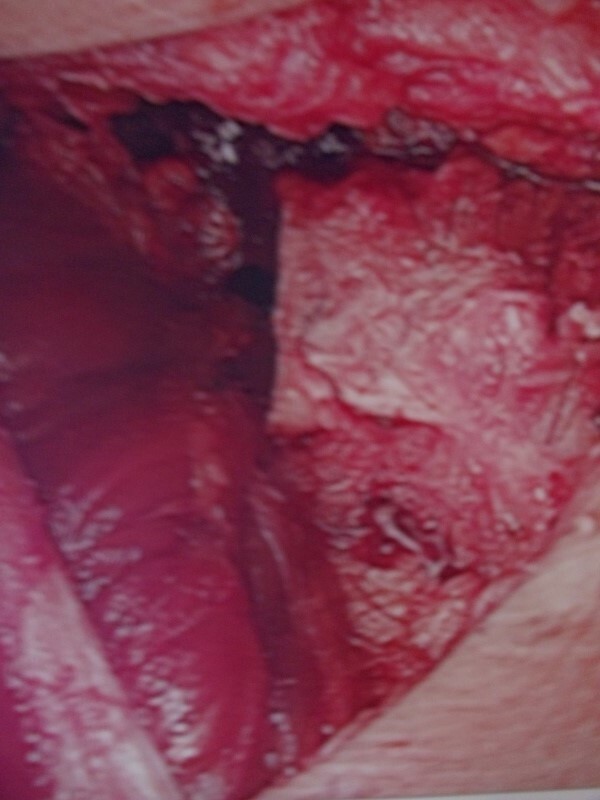 The shiny white area at the upper right corner of the surgical field is the talar neck. 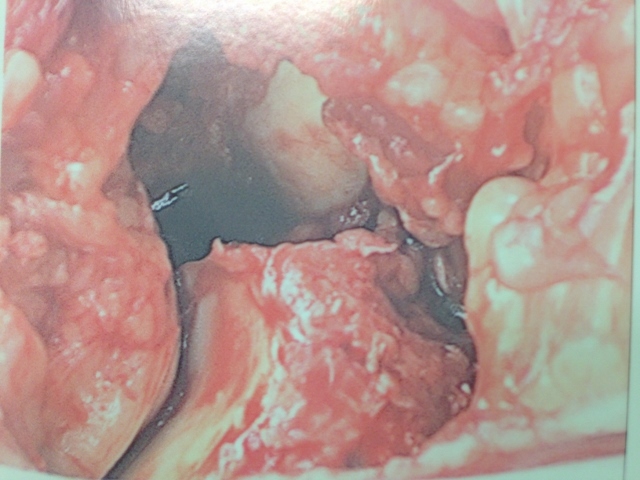 The coalition is fibrous and this is why a cleft can be seen instead of one solid bone. 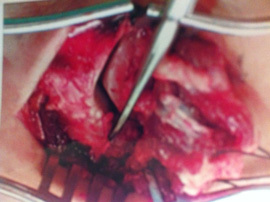 An osteotome is being utilized to resect the coalition and adjacent bone. 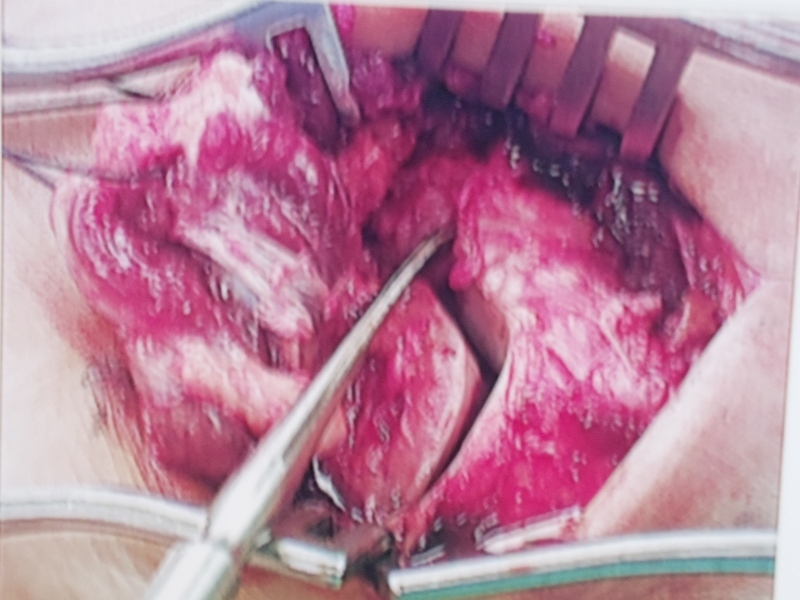 These are pcitures of a 14 year old boy who has a flatfoot due to improper casting. Due to the cast applied for an injury, the patient's tendon on the outside of his leg (peroneus brevis) is in constant spasm . This causes a flatfoot due to the constant pull of the foot to the outside. The difference between the normal left and problematic right is seen on these pictures.